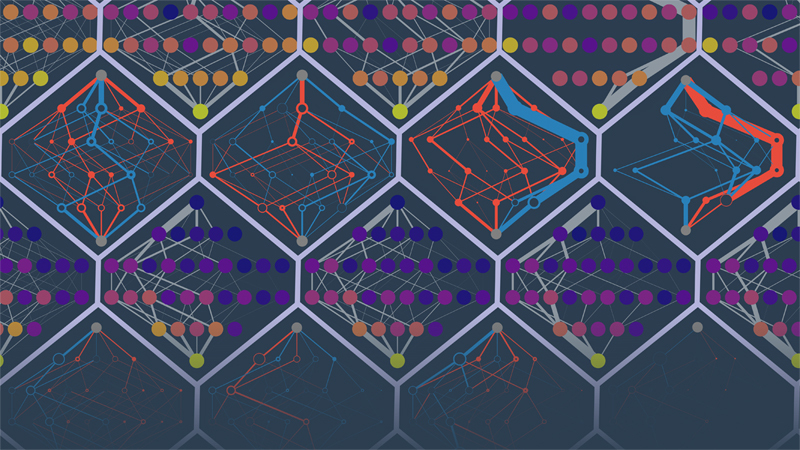 Using computer simulations, UO scientists thought that they could manipulate a protein one mutation at a time and predict its evolution. They failed, but the team harvested information that may be useful for understanding problems such as antibiotic resistance. The reason their efforts didn’t work out involved the fundamental physics of a biological system, the two-member team reported Oct. 23 in the online early edition of the Proceedings of the National Academy of Sciences. Physical limitations make uncertainty the norm, they reported in their study. The research was performed with computer simulations designed by UO doctoral student Zachary R. Sailer. In collaboration with Harms, he created a simple lattice protein, using an approach previously created in the Harms lab, with a random sequence of 12 amino acids. The goal was to use the effects of all 228 mutations known to be associated with the starting protein to predict which mutation would occur and when. Their ability to project the future faded fast after the first two mutations. In their paper, Sailer and Harms suggest that thermodynamics are at play. Each mutation alters the protein in a small, but nonlinear way. This means that the effect of each mutation depends on all mutations that occurred before. Sailer’s programming skills were developed while he was an undergraduate student studying condensed matter physics at California Polytechnic State University in San Luis Obispo. While he understood the subject, he said, he found himself excelling at writing codes for computer simulations. After admission to the UO’s doctoral program to work in Marina Guenza’s chemistry lab, he connected with Harms as part of a required lab rotation. Sailer was able to apply his knowledge in physics and expertise in computational programming to help address a fundamental biological question, Harms said. How proteins evolve is a fundamental question in evolutionary biology, from a philosophical perspective — to learn more about the machinery of biological systems — and for clues that might lead to improved or better drugs. “Practically,” Harms said, “our research may help us learn how to prevent the evolution of antibiotic resistance in bacteria.” Almost all bacteria-borne infections are developing resistance to antibiotics, creating a leading public health concern around the world. Work is underway in the Harms lab to test for this possibility on real proteins. The Alfred P. Sloan Foundation funded the research. The UO also provided research funds to Sailer.